Hello lovely makers and creators, I have another real treat for you today, today we are featuring one of the very talented artists in residence at the Flutterby Art Boutique. The Flutterby Art Boutique is run by the lovely Kate Williams and hosts a wonderful array of high end designer products to purchase along side a whole host of lovely vintage fabrics, haberdashery, antiques and so much more. Its a real treat to visit the boutique, there is ample free parking, lots of classes and groups taking place and a lovely tea room. 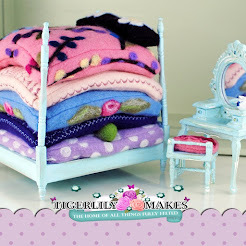 You can keep up to date on the official Flutterby Boutique fan page and today I thought we would showcase just one of many designers in the boutique. Handcraftily (aka Kharis Harvey) is a crafty creator based in a sleepy village in Staffordshire. 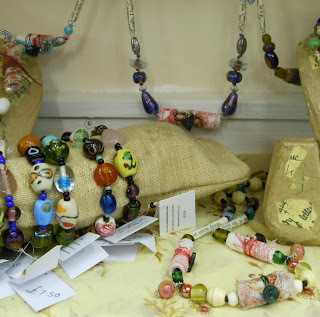 She spends most of her time recycling and upcycling old jewellery, creating beads from paper and fabric, making gifts for people, and dreaming of a house by the sea! Formerly a college and university lecturer and holistic and talking therapy student, Kharis has always enjoyed making things and believes that everyone should be more creative in their daily lives and that handmade products should be encouraged and promoted by such businesses as the Flutterby Art Boutique! Kharis’s main passion is Jewellery, although she also loves working with fabrics and clay and has recently been bitten by the steampunk bug! 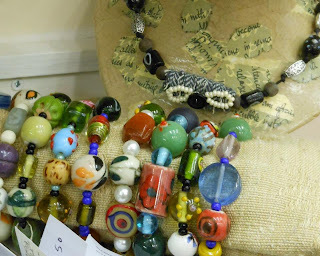 Handcraftily is constantly working on new jewellery designs and can normally be found making a creative mess somewhere!! with a selection of her work. Her work is available available to purchase in store at Flutterby Art Boutique and I would highly recommend a visit to truly appreciate the beauty of Kharis's wonderful work.